When events such as this occur, it is essential that we make sure our clients aren’t pushing product or seemingly “cheery” type posts during a tragedy of this manner. The world isn’t going to stop, but we as community managers and public relations pros need to be sensitive. 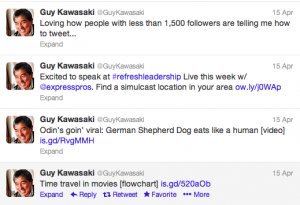 This wasn’t the case with well-known social media personality Guy Kawasaki. He was taken to task for continuing to send out auto-tweets during the bombings. His top response to being criticized on Twitter? The tweet above knocking how many followers you have and if you can criticize him was pretty sophomoric. The public response to that tweet took him to task. However, Steve Crescenzo took it a step further. He hacked Kawasaki to pieces in a Ragan.com blog. I think Chapter Four of that book is titled: “Talk down to and insult anyone who has fewer Twitter followers than you, as they know absolutely nothing about anything. I’m all for holding people to a higher standard, when warranted. I thought Kawasaki could have responded better, especially as someone who is respected. But, the ax grinding by Mr. Crescenzo is unnecessary. Crescenzo is a corporate communicator. I don’t think he would approve name-calling as a “best practice” for his clients. I know I wouldn’t. As PR pros, social media managers and marketers, calling our peers by names is unprofessional. Want to criticize CNN for their massive reporting failure on Wednesday? Go ahead. If you are going to criticize Kawasaki for auto-tweeting though, you better find all the other pros and companies that did the same thing. Calling Kawasaki a “prick” in a blog piece on Ragan.com certainly calls more attention to Crescenzo than it does Kawasaki. Frankly, I think it’s a disgrace. We can -and should- be better.